No visa is required for a visit to Phu Quoc. If you have a transit in Vietnam you will collect your visa during this transit. The transit time must be at least 2 hours. Collecting your visa may take between 10 and 40 minutes. For faster delivery service please choose a tourist visa! If you select Phu Quoc as airport of arrival you will receive a visa approval letter which is only valid for Phu Quoc. If you select Ho Chi Minh, Da Nang, Hanoi or Nha Trang, then the approval letter is valid for all these 4 airports. For example: you have mentioned Hanoi in your visa application. You may then arrive in Ho Chi Minh, Nha Trang or Da Nang too, but not in Phu Quoc! 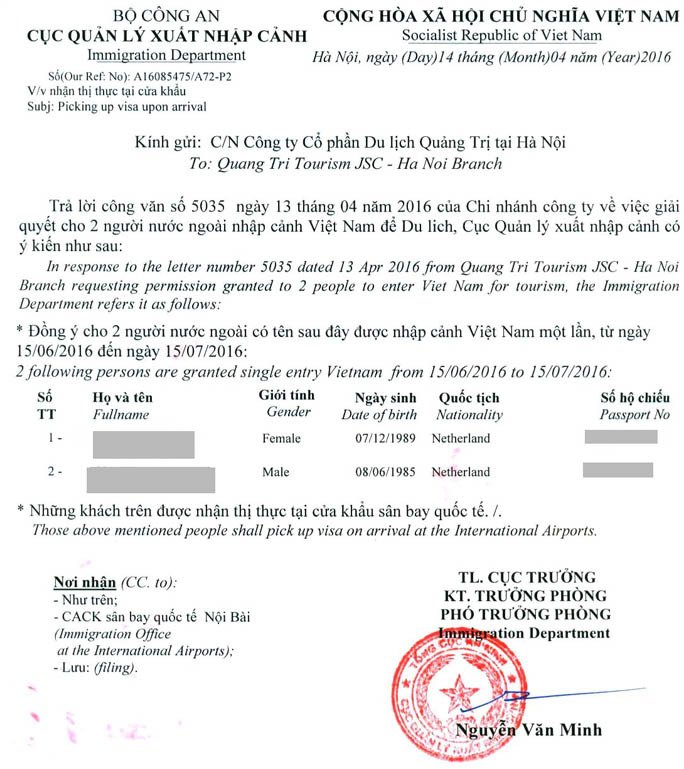 Visa approval letters are issued by the Vietnamese immigration office. The letter will show your name, passport number, nationality, date of birth and the period that your visa is valid for. As standard the Vietnamese immigration office combines several travelers to Vietnam in one visa approval letter. You might therefore see other names mentioned of persons you don't know.